With so many break-ins occurring daily, now is an excellent time to think about home security layering. This cost-effective strategy involves creating multiple layers of various types of protection. Each obstacle makes a burglary more difficult, slowing down the thief as he reaches each layer. Not only is this time-consuming, it is exhausting. Thieves are more likely to go elsewhere. Make your front door a tough layer to break through. Install a combination of standard and deadbolt locks. A latch or security bar will also boost home security layering. If someone invades your home while you're inside, interior door locks and latches may prove helpful. Some doors have a detachable "chain latch" that attaches to the wall. It's safer to look at visitors through a peephole before opening the door. A criminal can break this chain with adequate force. However, it may be your only protection if a thief picks the lock. A "mud room" with a second locked door provides another layer of protection. The same goes for a storm door with a lock or latch. 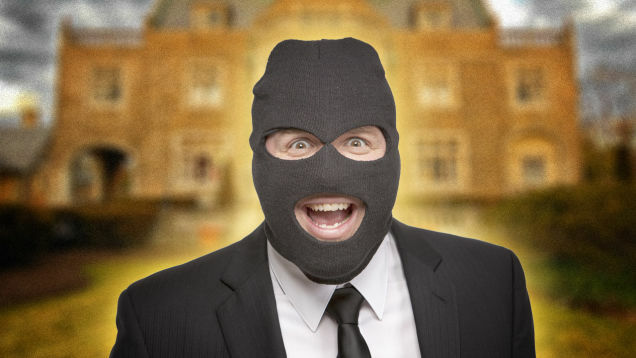 Burglars don't want to spend extra time breaking in; they're more likely to get caught. Sturdy doors and locks won't help much if first-floor windows are easy to infiltrate. Locks, shutters, multiple panes and bars make them a more formidable layer. Consider using thick curtains to prevent criminals from seeing valuables in your home. If you plant a bush with sharp thorns below a window, thieves won't want to climb into it. Use care when applying this technique. Burglars may benefit from shrubbery that they can hide behind. A gated fence will restrict access to your driveway or private sidewalk. It's best to install a fence or wall that's too tall to easily climb over. An advantage of chain-link construction is that passersby can still see any criminals who manage to get inside. Bright lights will boost security if they're located near doors and windows that are visible to neighbors, pedestrians or motorists. This is even more effective if the home security layering has motion detection. Consider using a home automation system to switch lights on and off while you're away. Street lights near your home deter criminal activity as well. Think about trimming any trees or other vegetation that prevent their light from reaching your home. If the bulb burns out, contact the local government and politely ask them to replace it. As a last resort, things like pepper spray and guns can deliver an extra security layer. Only use them if someone invades the house despite your warnings. Remember to exercise caution; firearms cause accidental injuries for many adults and children, and this often leads to accidental death. Thieves may sever phone lines before breaking in. Some criminals also take advantage of power outages that may render cordless and possibly cellular phones useless. It's harder for someone to cut off your contact with the police if you have more than one communication option. Indoor and outdoor surveillance cameras boost home security layering as it forces intruders to think twice about invading your home. If you don't have a peephole, this equipment provides another way to look at visitors before you open the door for them. An alarm system ranks among the most effective deterrents. Monitored, wireless models work best in many situations. Be sure to notify burglars of an alarm's presence by putting up a sign or attaching security company labels to your windows. Some thieves can be foiled by a single layer of protection, such as a sturdy locked door. Others are much more determined. Nonetheless, they're more likely to give up when faced with a combination of several layers, such as a security system, bright lights, multiple locks, and surveillance.